Having only read two of the five books so far, I feel confident enough about Birdie to say that I think it will be a strong contender. The themes in this book are not new themes, but the way Lindberg explores them in her novel felt fresh and meaningful; reconciling with the past, searching for identity and a place to call home. Instead she finds a job and a place to live at Lola’s cafe. This is where Bernice has decided she’s had enough of her past and her demons. She goes to bed and doesn’t get up again for weeks. She goes into a dream-state in search of an answer to who she really is, buried deep down under all the abuse and hurt and secrets. Auntie Val and Skinny Freda are summoned by Lola, and the 3 women take turns by her side. The dream-state that Lindberg creates could have been a hokey mess, but she pulls it off, making it not only believable, but also beautiful and necessary. When it was time, and when the fury of her past began to race ahead of her future, she simply lay down. Where she went depended upon something that she could not control. All she knew was that she usually ended up someplace where the past lives with the present, and they mingled like smoke. Once it cleared she was almost sure she would see her future. She does not have the cognizance of her body and surroundings as she did in life. She has, instead, the distinct impression of a being disconnected from the living but even more intricately connected to life. She realized she would have to save herself. The silence about what was happening around them seeped into the kitchen, first. Permeating the curtains. Eating into the linoleum. Eventually settling in the fridge. It was like some sort of bad medicine – it made Freda skinny, Bernice fat, and Maggie disappear. The pure red rage of her seeming complicity – her failure to scream, to speak of this, to fight it, to cry – washed over her. The perfect book, to Bernice, would depict a clean house with flowers in every available container. There would be no cigarette burns in gaudy-coloured carpet, no empty bottles or glasses half-drunk or spilled on the floor on weekends, and no visits without invitations from her parents’ friends. No one would bother her in her room under the stairs, and she wouldn’t be woken up by thundering feet up the steps (a fight) or the thudding down the stairs (someone falling down). There would be happy shiny people who always hugged and smiled. they would never put each other down or make fun of one another to make other people laugh. Her ache for home, home being something she does not yet understand, and a place she has never been, brushes over her like a skirt hem on the floor. She is so hungry. Not for food, not for drink, not for foreign skin. This appetite that sits next to her now is relatively unknown and persistent. She is hungry for family. For the women she loves. For the sounds of her language. For the peace of no introduction, no backstory, no explanation. Birdie’s mother, Maggie, plays a big role in her life, both when she is present and when she is absent. In the end, it is her absence that sends Birdie over the edge. Where has Maggie gone, and what is her story? Another book is needed here, I think. 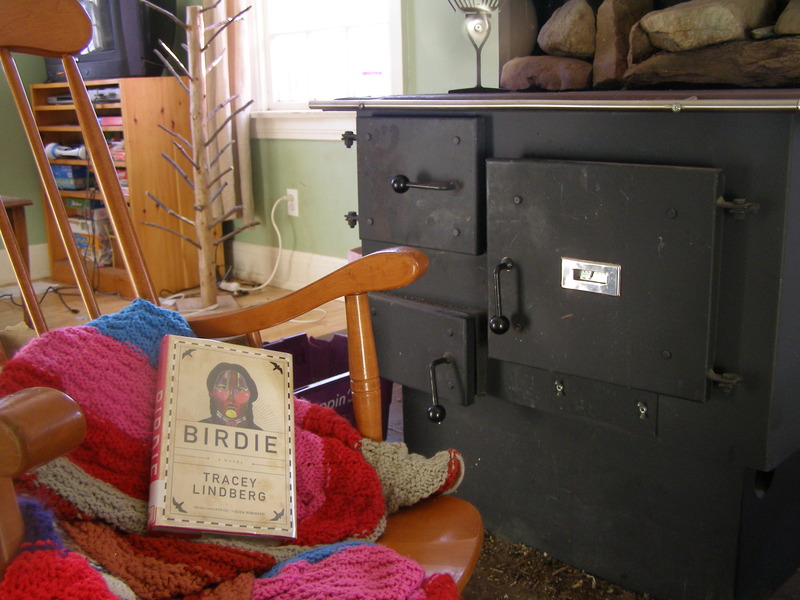 One thing I haven’t mentioned yet is that Bernice is a Cree woman, as is the author Tracey Lindberg. This adds a whole other level of depth to the story, of course, but the reason I didn’t focus on it at first is because I think the journey she takes in this book is one that can be universal. 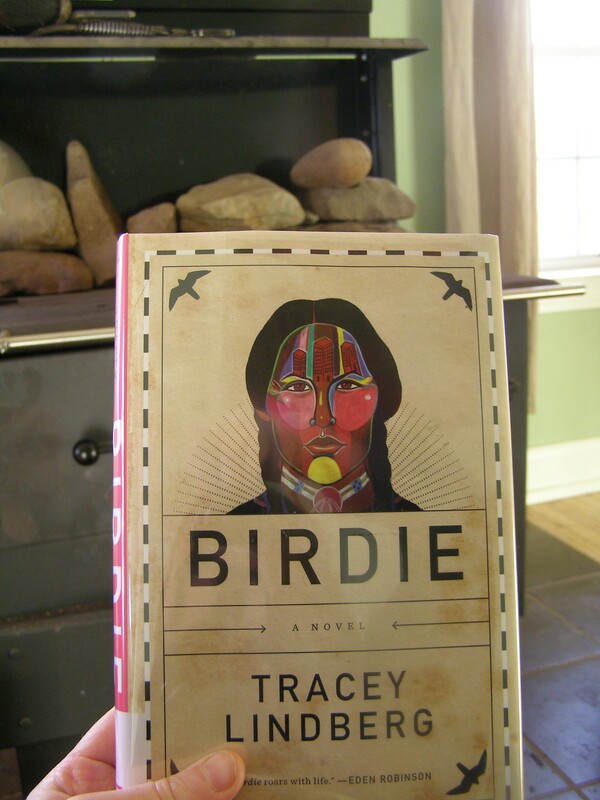 However, Birdie’s personal story is also influenced by her background and her family’s history, and, as such, contributes an important voice to the discussion around aboriginal issues in Canada. For more in-depth and already written pieces about this, see the reviews of Birdie in The Globe and Mail and The National Post. Lindberg’s use of language is a highlight of this novel. I found the writing both poetic and playful, with a whole host of made-up compound words that go far in aiding her description of the range of relationships and complex emotions happening in the novel; sistercousin, fearanger, griefanger, sleepingwake, thinksnipes. Also included in the book are snippets of dreams and stories relevant to what’s happening with Bernice while on her ‘journey’. One more thing: The tree of life plays both a symbolic and a cultural role in this book, and because I have a ‘thing’ for trees and nature, I had to mention it. 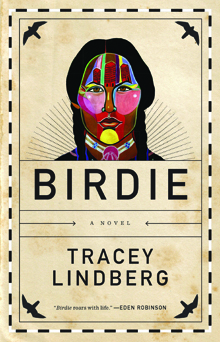 For what Tracey Lindberg has to say about Birdie and telling indigenous stories, see her interview with Shelagh Rogers on The Next Chapter. I want people to understand that individuals do make choices, but sometimes those choices are quite limited by the circumstances in which you have been placed. Or you have been defined by, or marginalized by, the circumstances that create an environment where hostility and violence can take place. 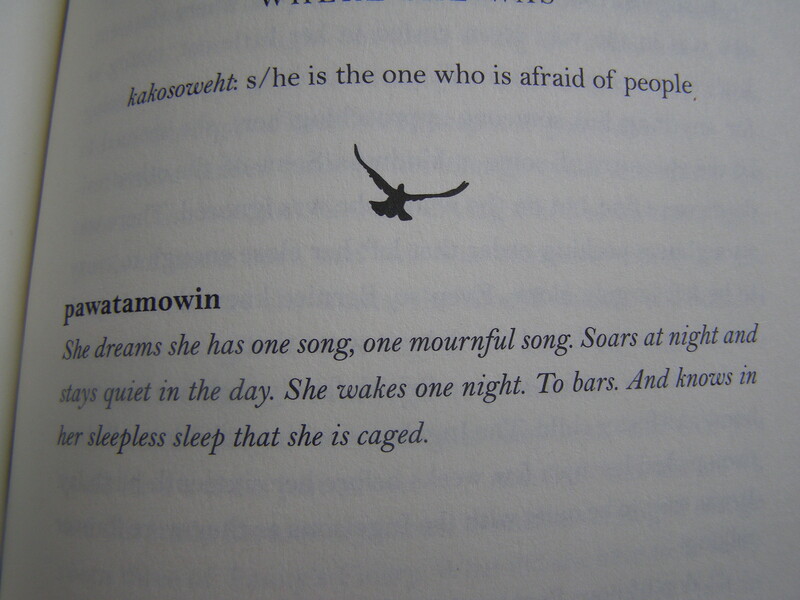 This book is meant to free, not to capture, a life. For those who see themselves in Bernice, I hope this frees you a little, too. 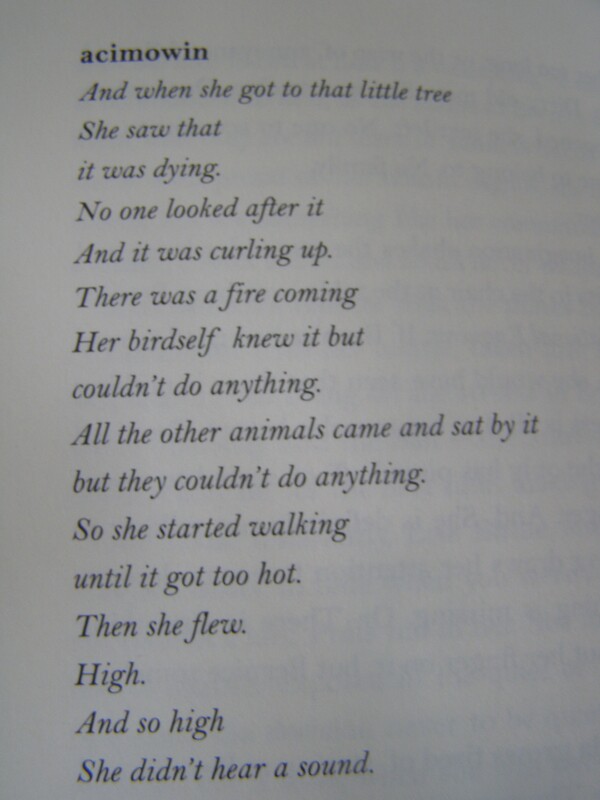 I recommend you read this beautiful story. Canada Reads, look out! I’ll have to wait to read this post as this one is on my list to read! Which CR books have you read so far? This sounds intriguing, Naomi. I love these kind of books. Adding it to my TBR. Thank you. 🙂 And, what a gorgeous cover! It’s a great cover, isn’t it? Hard to ignore. I think you would like this book, Deepika! This sounds very powerful, Naomi. I love the examples of the way Lindberg uses language that you’ve quoted. I love the way she writes. The book is quietly unique. Great review. I alway try to read all the Canada Read Books before the show as well. How is it going so far? Have you read any of them yet? what a brilliant review – thank you. I would probably not have chosen to read this book from its description alone but it is now on my wishlist – I love the quotes you have used as well as the premise. Thanks, Cleo! Convincing you to give this a try is what I love to do. 🙂 I hope you enjoy it! There were quite a few books on the Canada Reads longlist that sounded interesting. This was one of them, and I’m glad it got onto the shortlist. Your review certainly makes it sound worth reading. I was a bit skeptical when you mentioned the dream state, but judging by your quote, it does sound like the author pulled it off. The dream-state had me whoa-back at first, but then it just seemed a completely natural thing to do. Maybe we should all do it (except not for weeks at a time – maybe hours). This book sounds wonderful; I love the passages you chose. This review is the first I’m hearing of it, so I hope it gets more press here! I haven’t seen many reviews for it yet, either. I hoping that will change as Canada Reads gets closer!